The BCM Myanmar ministry team believes in dreaming big. A small nation in southeast Asia, Myanmar has a population of fifty million, largely Buddhist, that has been plagued by ongoing civil war for decades. BCM Myanmar’s vision is to see one million children come to Jesus Christ within the next thirty years and three hundred new churches planted. That takes teamwork—and lots of it! Which led to the founding of Bethel Baptist Bible Institute (BBBI) in 2001 in the capital city of Yangon. The property where the Bible Institute is based measures only 10,000 square feet, but encompasses a church and orphanage as well (see A New Home for Myanmar’s Lost Children, BCM World, December, 2014). Emphasis is not just on studying the Bible and theology, but training young people for active ministry in reaching children, church planting, and literature (BCM Myanmar director Jacob Mung is also director of CLC Publications, Myanmar’s largest Christian publishing house; see It All Started with a Book, BCM World, Fall, 2009). Specifically, their goal for ministry is to reach people groups and places that have not yet received the gospel, of which many remain across Myanmar. The Bible Institute runs completely on free will donations and volunteers. Faculty donate their time, teaching classes in both English and Burmese through a module system. One example is former BCM president Dr. Bob Evans, who traveled this year to Yangon to teach a one-week college-level module on Christian Marriage and the Family as well as to serve as BBBI’s 2017 commencement speaker. Twenty-two students along with fifteen pastors and other Christian ministry leaders attended the course five hours each day. Students live onsite in a simple dormitory and are provided with basic food stuffs. Cooking meals and other chores are divided among the students. This keeps costs low, but keeping the Bible Institute funded remains a challenge. But regardless of finances, BBBI has made a commitment never to turn away a student seeking training to serve God. In fact, enrollment for 2017 has doubled from the prior year. Current attendance include twenty-seven full-time students from seven of Myanmar’s many ethnic groups, including Lisu, Zomi, Lahu, Akha, Myo, Dai, and Maru, along with other ministry personnel who attend courses. 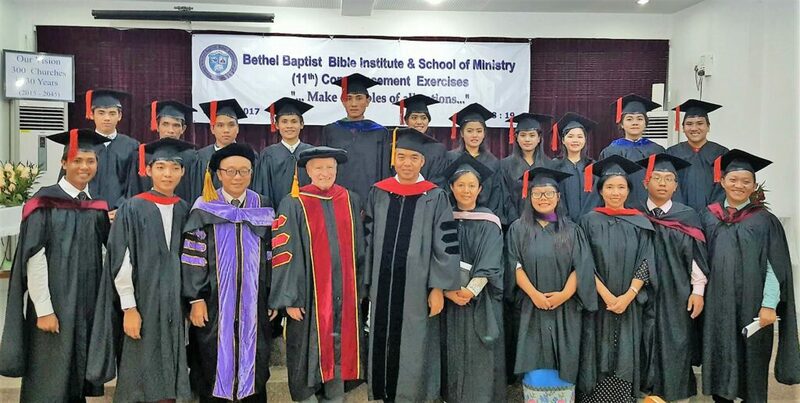 In total, more than a hundred young graduates have received training for ministry since the inception of Bethel Bible Institute in 2001.